Sujata G. Bhatt’s full-length play, Queen of the Remote Control, premiered at East West Players in Los Angeles under her co-direction. It had subsequent productions at Shunya (Houston), Mixed Blood (Minneapolis), and the Sacramento Theater Company, and readings at the Lark (NY) and the AATC (San Francisco). She has also written, directed, and dramaturged pieces for Artwallah, Edgefest LA, and East West Players. 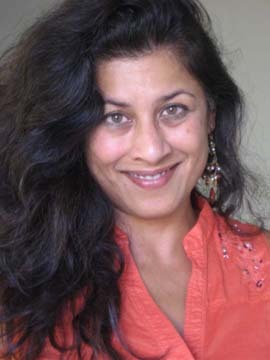 She has served as a founding producer for the ArtWallah, on the literary committee for East West Players, and the steering committee for SATAM, the South Asian Theater Arts Movement. She has also received a grant from the Creative Capital Foundation. Badger, a short film for which she wrote the screenplay, appeared at numerous film festivals around the world. Prior to entering theater, she was a medieval historian trained at the University of Michigan and a Junior Fellow at the Society of Fellows at Harvard. Presently, she teaches children in a Title 1 school in the Los Angeles while also writing. She is working on multiple projects: a full-length play, Driveway, about a gang ghost haunting a couple in a gentrifying urban neighborhood; a full-length play, Invisible Hand, about the multiplicities and duplicities of life in LA; and a feature-length screenplay, Without a Map, about two women looking for love and instead finding friendship in Baja, Mexico. It’s 1999 and the seemingly boundless days of the dot.com bubble. Shilpa Shah, a bright, sarcastic 17 year-old, longs to smash the glassy screen of her Indian family’s upper middle class LA life. When her brother and his fiance arrive from Silicon Valley, the screen shatters loosing all the ugly secrets of class, color, greed, and religion her parents have guarded for years.